Sometimes I want something light for dinner. And by light, I mean no heavy sauce but still rockin’ with flavor and satisfying. I played around with this light olive oil sauce a couple times until my husband actually requested it! Totally caught me by surprise since my steak-and-potato man usually doesn’t enjoy lighter dishes…. shows how amazingly tasty my garlic chicken pasta recipe turned out. Have you heard about the controversy between real and fake olive oil? Apparently the Mob or some really scary rich people have been producing olive oil for 20 plus years with less quality oils (canola, sunflower seed, etc.) and claiming it’s 100% olive oil. They might as well take out their huge wallets and smack us across the face! There are home taste tests, refrigerator tests, and other purity tests which can help you determine whether or not the brand of olive oil you’re using is the real deal. AND there’s also controversy within the controversy. So… what do I do with all the conflicting info? My best research and stick with a brand I feel is legit. Unless you want to spend $54 for a small bottle of the most expensive pure olive oil (I looked it up), here are four brands that have passed the standards established by the International Olive Council. Since I love my Costco, I usually go with Kirkland. 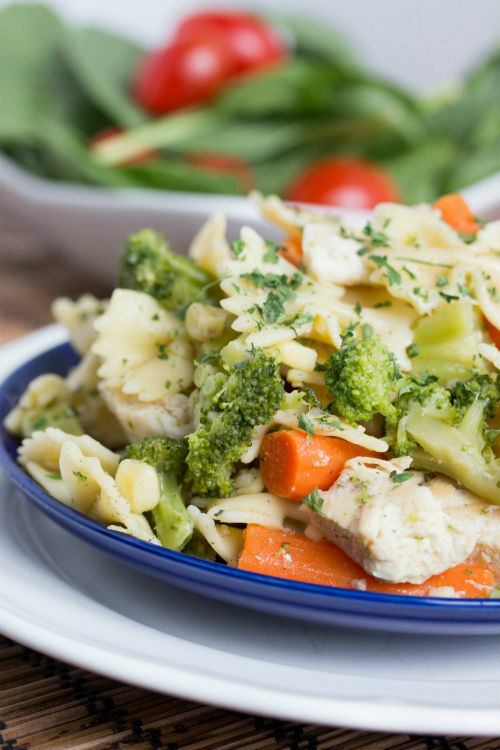 You may have noticed that I’m a big fan of dinners that combine chicken and vegetables like my Chicken Fiesta Soup, Pineapple Chicken Fried Rice, and my Pasta Primivera recipes. I’m not against side dishes. Especially if the side dish is asparagus with coconut oil. However, I love the combination of juicy chicken and crisp, fresh vegetables blended in one bite. 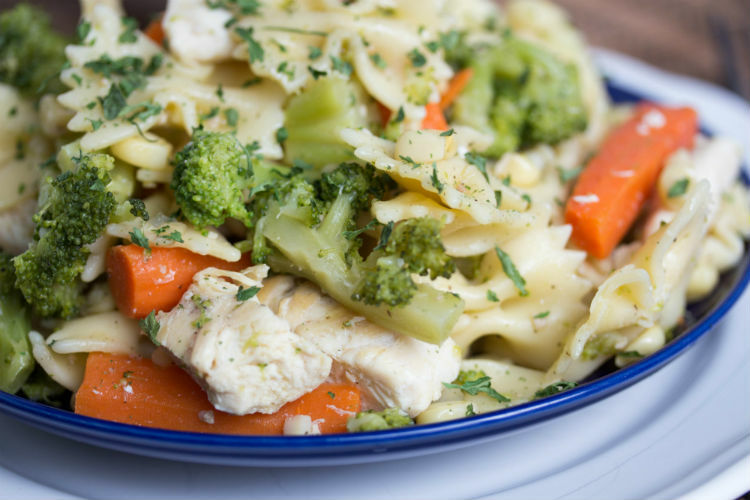 I’m also loving how this garlic chicken pasta has just enough sauce to keep it from being bland but doesn’t overpower the natural flavors. Broccoli and carrots deserve the spotlight sometimes. One last thing… I’m officially a Garofalo pasta addict. It’s Italian, you can taste the quality, and it’s not crazy expensive. I first found it at Costco. Anyway, definitely recommend trying it! 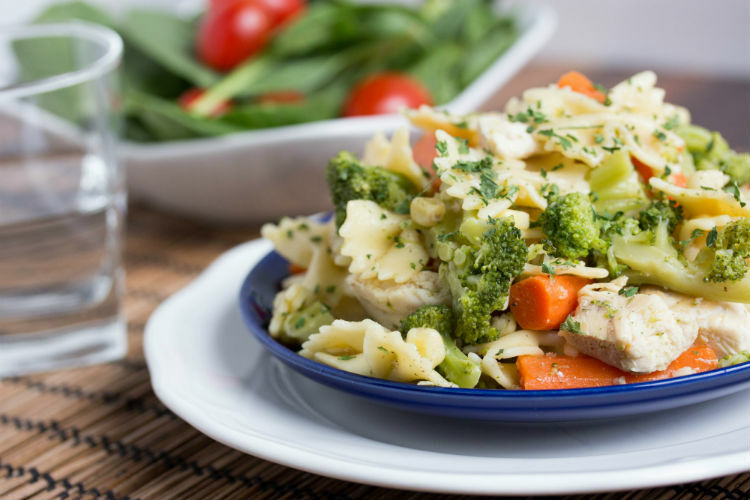 Enjoy your light garlic chicken pasta! 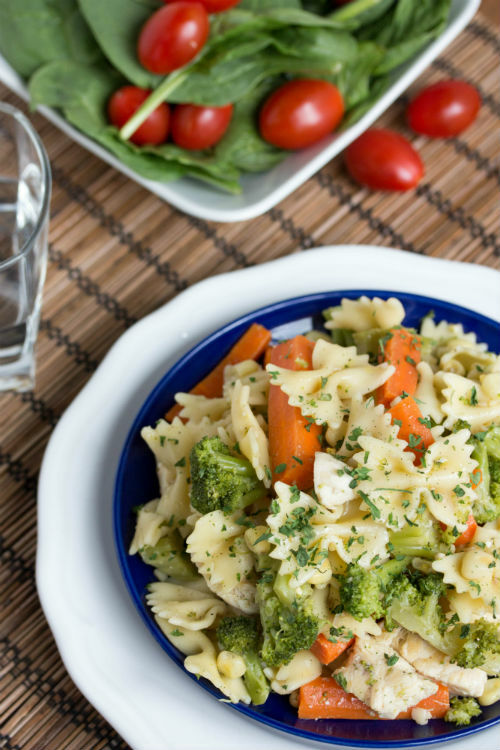 In a small bowl, combine olive oil, garlic, salt, pepper, and crushed pepper. In a large pan over medium heat, pour olive oil mixture and heat for 1 to 2 minutes. Cook until garlic turns golden brown. Add chicken and cook only until no longer pink. Removed chicken pieces and place on plate. In the remaining oil mixture, cook carrots for 2 to 3 minutes until slightly tender. Add broccoli and corn. Cook for additional 1 to 2 minutes. 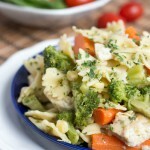 Return chicken and cook pasta to dish. Stir until everything is covered in olive oil sauce.